Early this morning, Hubby and I set off on the motorcycles to ride to Angleton, Texas. It’s not really a long ride, just about an hour, and fairly scenic through pastureland mostly with a couple of small towns on the way. This is not something we would normally do on a Monday morning. Thursday last week, when he was on his way out the door to work, Hubby mentioned that he had received a jury summons. He wanted me to mail it back. It was for today. After he was gone, I noticed that he hadn’t signed it, which was a requirement for exemption. After he got home, I had him sign it, and prepared to mail it Friday. Then I noticed the date. Obviously, it is all my fault that the USPS cannot deliver mail to the courthouse that is mailed on Friday morning, and which needs to be received before Monday morning. Especially since the courthouse is closed on weekends. So dropping it off this morning seemed to be the only option. I did suggest that we simply call, but that would perhaps be TOO easy. Thus, I saw the foggy dawn arrive and then surrender to a gloriously bright blue sky. Glorious, because it finally cooled down from the 100s into the 80s and 90s. tomorrow it is rumored to be in the 70s! Now it’s 1, and all I want to do is have a nap. 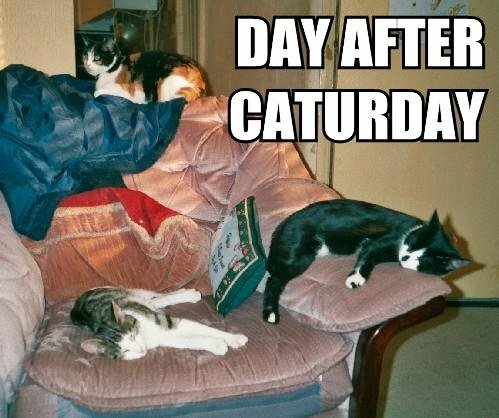 I really don’t care that yesterday was the actual day after Caturday. We got up at 5:30 and went to the airshow. So really, this fits today. And this is exactly what I’m going to do. For a while anyhow.